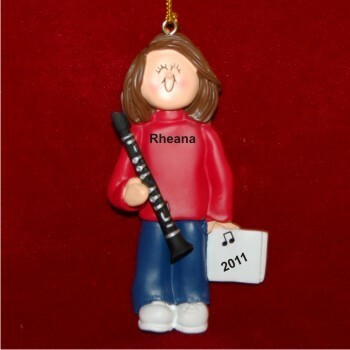 Your favorite clarinetist will be thrilled with this cute clarinet virtuoso female brown hair personalized Christmas ornament that arrives in our plush velvet gift bag. Our lettering artists add by hand the custom details you provide to these cheerful musical instruments ornaments personalized in many different looks. Display the brunette female clarinet player personalized Christmas ornament from the tree, in a locker or from the clarinet case - wherever it will bring the most inspiration and fun.